Long Provincial Vietnamese joins the current blaze of upmarket Vietnamese restaurants. TAM NGUYEN WAS was eight years old when he and his family were caught trying to escape Vietnam and thrown into prison. On their third attempt, they made it out and fled to Seattle, where he had an older brother who’d grabbed the last boat out when Saigon fell. Tam was 12. The Nguyens landed in White Center, and launched themselves into careers like engineering and pharmacy. A few of the siblings dreamed of creating a showcase for the cuisine of their homeland, one more cosmopolitan than the dives that typically served it. In 2004 they opened Tamarind Tree, a sleek Vietnamese restaurant that glittered like a geode inside a gritty strip mall off a rutted parking lot in Little Saigon. 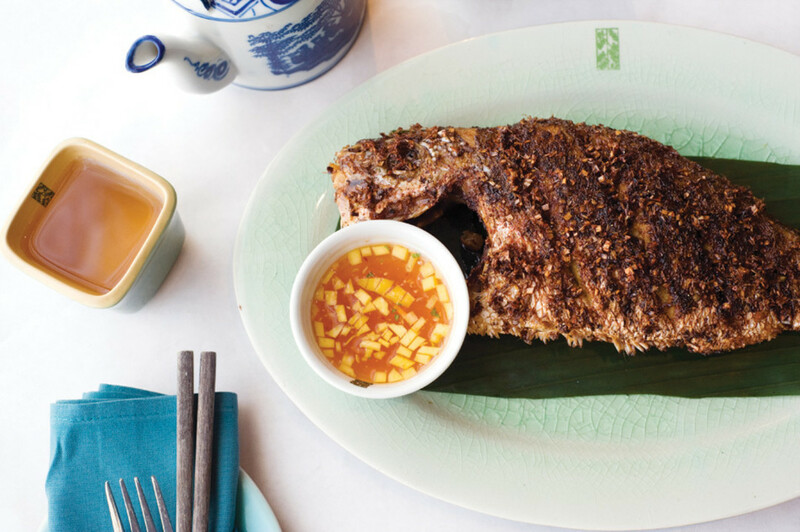 There, the bold flavors and textures of provincial Vietnamese food were enshrined in sophisticated preparations and surroundings—at dive prices. Lines formed. The New York Times came to call. Seattle had never been on a better date. Tam Nguyen sought to extend his reach into the downtown bar scene and late-night markets. So in March, he opened Long Provincial Vietnamese, joining the blaze of upmarket Vietnamese restaurants (Jasmine, Thoa’s, the Signature) ignited in part by the success of Tamarind Tree. Within the vacated Qube space Nguyen built a second classy destination: a bilevel room with an adjoining bar; all regal purple walls, glossy floors, and creamy white table linens. And covered windows. Long occupies the corner of Second and Stewart: on paper, the center of everything, but midnowhere by the measure that matters: the mood of the street. So Nguyen resorted to the tactic he’d perfected at Tamarind Tree, obliterating any hint of the outside surroundings from the interior. He shrouded the windows in shades. When I walked in I felt a pang of dislocation, as if I’d left downtown and arrived on a stage set. Generic easy-listening music, vaguely Asian, didn’t relieve the disorientation; nor did an all-things-to-all-diners 16-page menu, careening from satays to rice dishes to phos to specialty entrées…and so on. Long (pronounced laong), contrary to cheeky speculation, wasn’t named after its menu; it’s the name shared by Nguyen’s best friend and his nephew, both of whom are improving their lot in ways that Nguyen finds inspiring. Even the bar, with its brilliant jellyfish tank, had a dim singles-y vibe, with little sense of place. Could a destination this undefined deliver the essential ingredient of every great restaurant? Could it be vivid? To find out, I enlisted the help of a refreshingly frank waiter. At dinner, about two-thirds of the options come straight off the Tamarind Tree list—an efficiency that comfortably fits in the “ain’t-broke-don’t-fix-it” column. Four plump Tamarind Tree rolls, for instance, arrive in a vertical-horizontal arrangement, their jicama and carrots and herbs and fried-tofu crackles and roasted peanuts and freshly shaved coconut straining at their rice paper casings—bracing detonations of fresh sweet and savory and herbal components that play like an overture to the meal ahead. Vivid? Explosively. Upmarket stage set: Nguyen goes after the late-night crowd. The norm at Long, as at Tamarind Tree, is food that creates monsoon season in your mouth. A salad of julienned green mango, pickled carrot, and pickled jicama was tossed with greens and herbs and roasted peanuts, all topped with grilled chicken and fistfuls of frizzled shallots, and served alongside a bowl of peerless tamarind dressing. A crepe arrived as a crisp-fried half-moon of eggy pastry, bits of pork and bursting prawns and shiitakes baked into the rice batter, bean sprouts crammed inside, with a fragrance of coconut milk wafting like a soft breeze across the whole. There may be no more sensual dining experience than tearing off a fold of crepe, swaddling it in that ubiquitous Vietnamese chorus—coriander, lettuce, basil, mint—then dunking it in herbed fish sauce. Pastry dishes like these pay homage to some of imperialism’s finer influences. But the broad menu further reveals the lesser-seen cuisine of Vietnam’s tropics, like a dish of 12-hour-braised pork, sumptuously fatty, and lacquered in thick sauce with chewy spears of coconut that release their subtle sugars the longer you work them. Dried lily blossoms show up in a fine noodle dish of steamed halibut with soybeans and shiitake, oyster, straw, and black mushrooms. Nguyen exploits Western weaknesses shrewdly. Much of the menu traffics in straight-up comfort. Salted-chili crispy chicken wings are marinated in exotic Phú Quõc fish sauce, but their deep-fried feistiness would satisfy any Super Bowl crowd. In a straight pitch for the after-hours market, Long serves until 2am on weekends. All martinis are doubles. Nguyen even subs whole prawns for the prawn mousse on some dishes, having learned that they’re more palatable to Americans. All of which has contributed to the success of the Nguyens’ enterprises. But make no mistake: Long’s largest appeal lies in stunning execution of Vietnamese village food. By the time you’re licking the appealingly grainy homemade coconut ice cream off your spoon, even the soulless setting has receded into another place entirely.